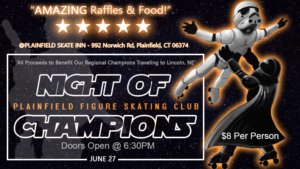 Come join the Plainfield Skating Club for Amazin Raffles & Food! Only $8 per person. 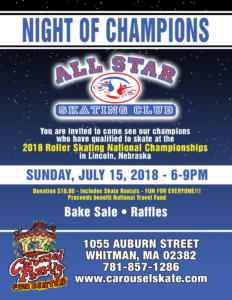 All proceeds benefit our regional champions traveling to Lincoln, Nebraska for nationals. 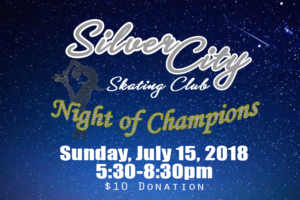 Silver City Skating Club Night of Champion on Sunday July 15th 5:30pm - 830pm. 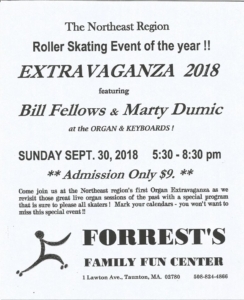 Come join Marty Dumic and Bill Fellows at the Northeast region's first Organ Extravaganza as we visit those great live organ sessions of the past with a special program that is sure to please all skaters! Mark your calendars - you won't want to miss this special event!! 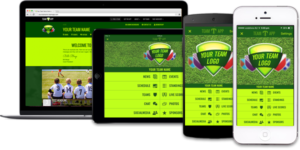 Hosted at the Forrest's Family Fun Center, 1 Lawton Avenue, Taunton of Massachusetts. The annual NEUSARS meeting will be held on December 1, 2018 at 1:30PM at Pinz – Milford. The address is 110 S Main St, Milford, MA 01757.